Sunday night, part of me wants to get take out and part of me wants to make something in my own kitchen. Lucky for mine and Billy’s taste buds we made something amazing in our own kitchen. I had so many fresh ingredients from the Farmer’s Market I whipped this little gem of a dinner together. I have to give credit where credit is due so this salad recipe came from one of my client’s ,Charlie. Every time she comes for a haircut all we do is talk about food, so thanks Charlie for the great idea and we’ll be making that salad again this week. 1. Cook the ravioli according to the directions. 2. While the ravioli is cooking start by placing a medium saute pan over medium heat. 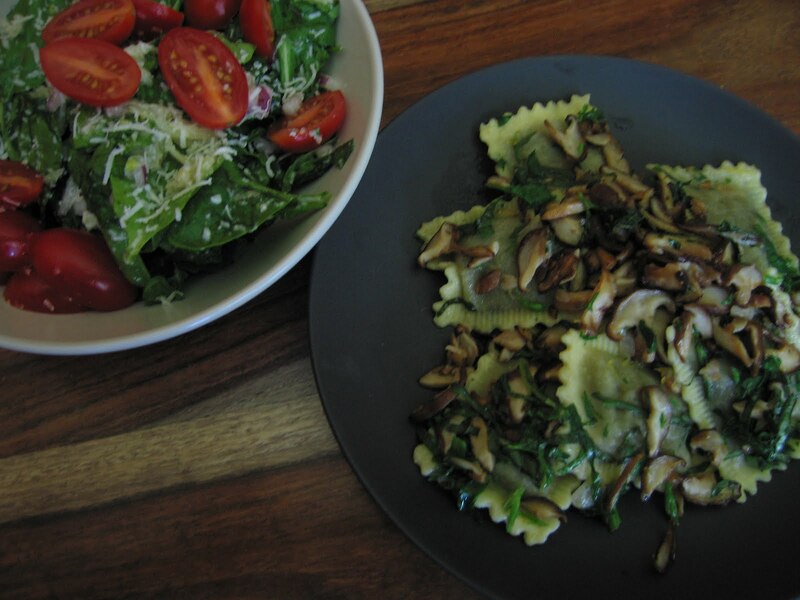 Place the butter or olive oil in the pan to warm when ready add the mushrooms, garlic and onion and begin to saute. Add a little salt and pepper to taste. 3. When the ravioli is done drain and set to the side. 4. Saute the mushrooms, onion and garlic just until the mushrooms brown. When done turn off heat add to the pan the ravioli, parsley, basil, zest and juice f lemon. Toss lightly and serve promptly. Enjoy! 1. Start with a large bowl, in the bottom of the bowl add the lemon juice, garlic, olive oil, salt and pepper to taste and the cheese. Whisk all together. 2. Add the two lettuces, onion and fennel to the bowl and toss well. Divide between two bowls and top with the cherry tomatoes. Enjoy!